Time: 1:00pm - 3:00 (please arrive no later than 12:45) and check in with me. I will have an Everest Academy sign so you can find me easily. Cost: The price is $7 per person attending. This price includes "Anything is Possible" Performance plus opportunity to take a trip up the observation deck at the end of the performance and explore the museum on our own if we would like. Deadline: Deadline for payment, cancellation, and refund is Nov. 6th. No refunds will be issued after October 30th. Spots are limited, so please RSVP as soon as you can. Your payment reserves your spot. Restrictions: This performance is for ages 9 and up. This is a theatrical performance that lasts 30 minutes. See our museum exhibits come to life through a live theatrical performance inside the galleries of Vulcan Center Museum. Professional actors depict the people who transformed Birmingham from a sleepy cornfield into a dynamic industrial city. 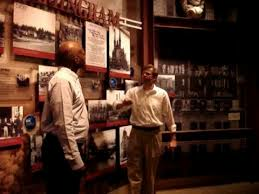 Students encounter John Milner, James MacKnight, Giuseppe Moretti and Dr. Martin Luther King, Jr. Over 140 years of Birmingham history are covered in this work written by playwright Lee Shackleford and commissioned by Vulcan Park and Museum. RSVP: If you have any questions or wish to RSVP, please contact Jen Bohan at jenbohan77@gmail.com. When RSVPing, please include how many kids, their age, and how many adults that will be with you. I prefer payments be sent via Paypal to jenbohan77@gmail.com. If you can't do Paypal, send me an email and we will arrange something else. Click the link below for more details about the museum as well as directions.